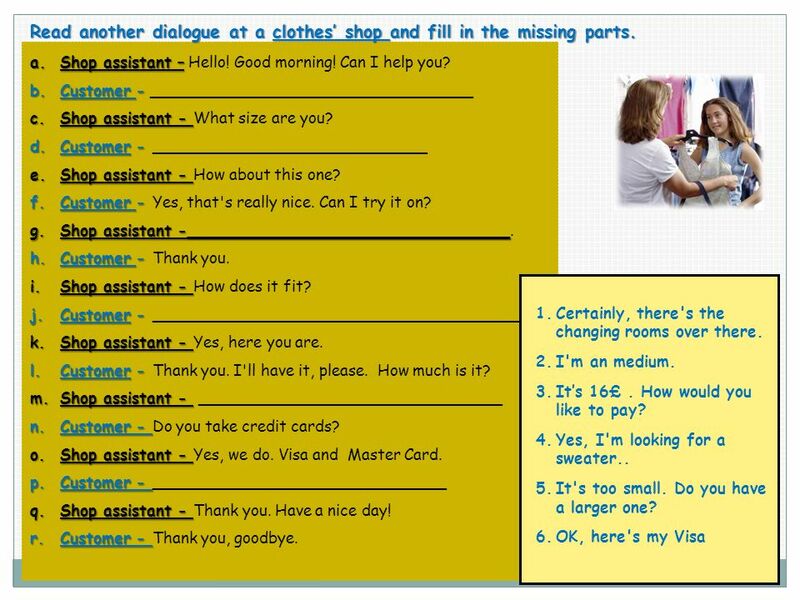 2 Read the dialogue at a clothes’ shop and fill in the missing parts. Salesman: Good morning, madam. _________? Customer:	Yes, please. ______________________. Salesman:	______________________________? Customer: Thirty-eight. Salesman:	What colour would you like? Customer: ______________________________. Salesman:	_______________________________? Customer: Yes, it’s great. Salesman:	Would you like to try it on? Customer: Yes, please. Salesman:	___________________________. Customer: Thank you (…) Salesman:	_____________________________? Customer: Yes, it’s perfect. I’ll take it._____________________________? Salesman:	It’s £25. Customer: Here you are. Salesman:	____________________________. Customer: :	Thank you, sir. Good-bye. What size, madam? Thank you, madam. Have a nice day I would like to buy a sweater. I would like a dark red sweater. There is a changing room over there. How much is it? Can I help you? Do you like this one? Is the sweater the right size? 3 key Salesman: Good morning, madam. Can I help you? 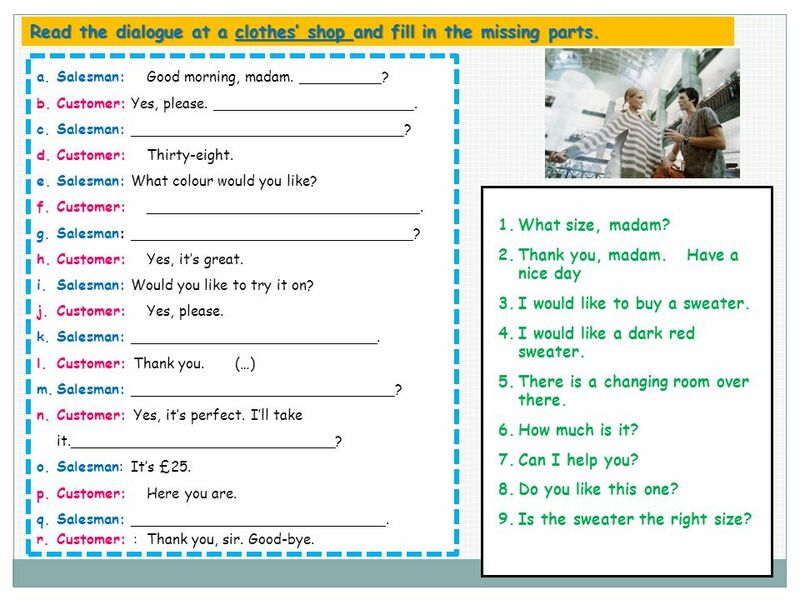 4 Read another dialogue at a clothes’ shop and fill in the missing parts. 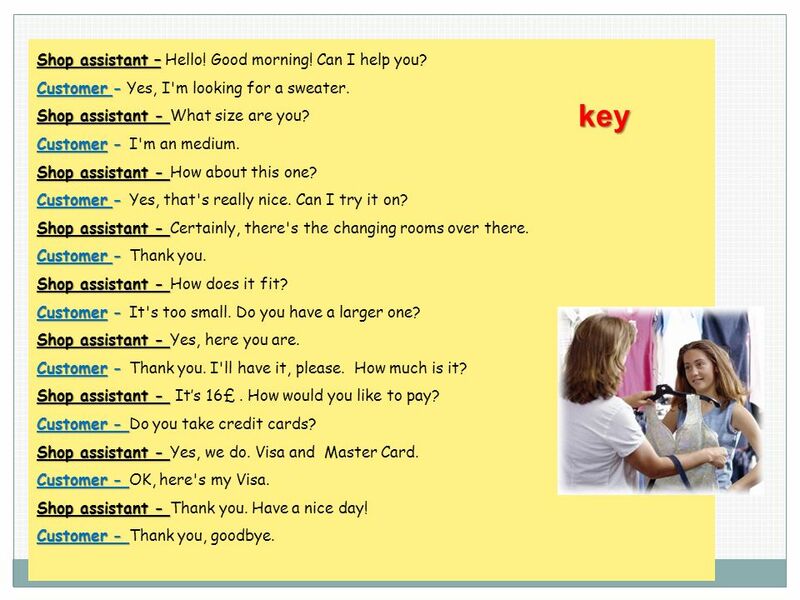 5 key Shop assistant – Hello! Good morning! Can I help you? 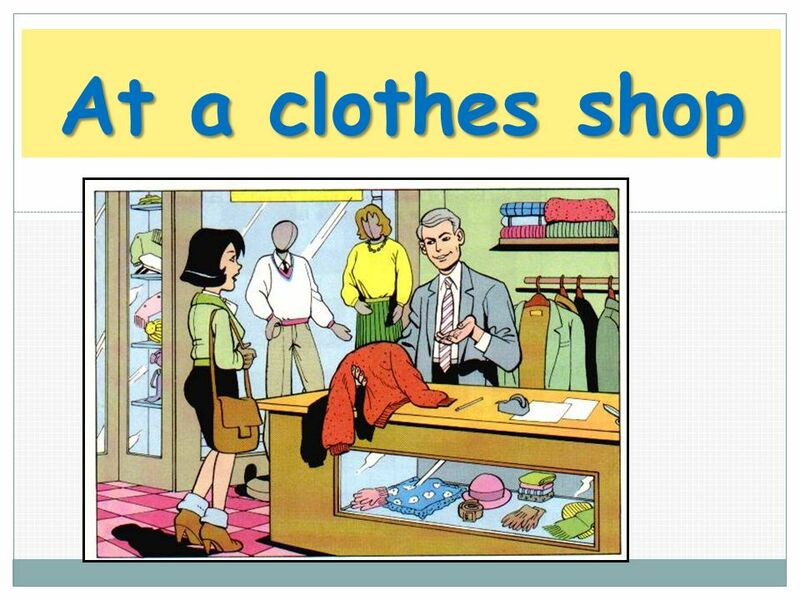 Download ppt "At a clothes shop." Unit 6 Shopping November 8 By Miss Zhu. Free talk When do you usually go shopping? Who do you usually go shopping with? Where do you usually go shopping? Unit 3 Is this your skirt? A Read and write. Look and say! redpink brown black purple orange white yellow green blue. Unit 10 Shopping Period 3 Unit 10 Shopping Period 3 Vocational Education Hotel English. Go shopping Italian Fashion Brand Names Another industry in which Italian brands have come to the forefront is the fashion industry. Armani, Gucci, Prada. Unit 7 Going shopping 武进区卜弋初级中学 李英. I am very busy these days. Can you guess why ? 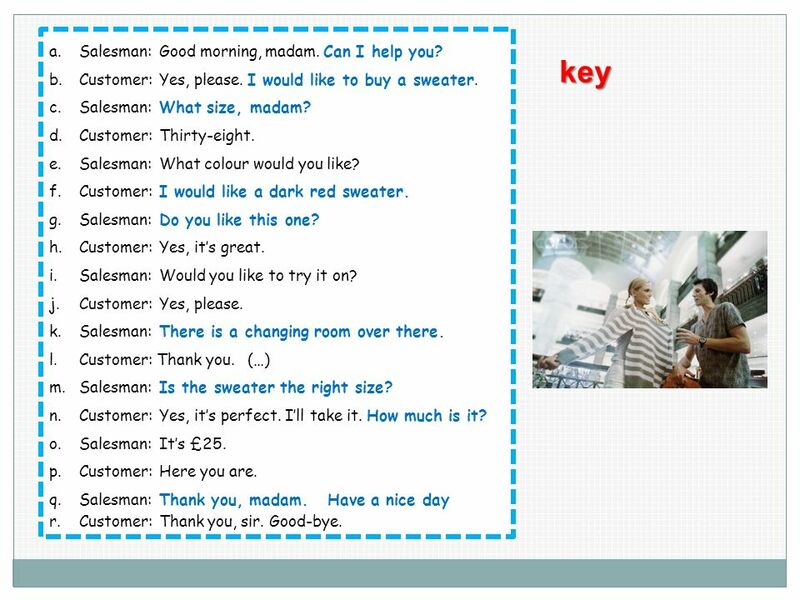 Longman Welcome to English Self-Access Learning P.6_Bk A : Chapter 5. DEPARTMENT STORE Vocabulary On the second floor. I’m looking for. Can I try it on? Will it go with? Have you got them in a larger size? A shool trip to England Szkoła Podstawowa im. ks Franciszka Blachnickiego, klasa V.
D I A L O G U E Clerk : Can I help you? Client: Yes, I’m looking for some shorts. Clerk: What size do you need? Large? Client: No, I need an extra small. Airport Useful expressions. Buying a ticket  I'd like to reserve two seats to New York.  Will that be one way or round trip?  How much is a round trip. Teacher Koledinova A.A.. Always say good-bye before you hang up the telephone. Always use a pleasant voice when speaking on the telephone. Don’t speak. In a few weeks the summer holidays will begin You will go on a holiday to Hangzhou. Question: Which one do you prefer, the cheap one or the expensive one, if you’re shopping for these things?